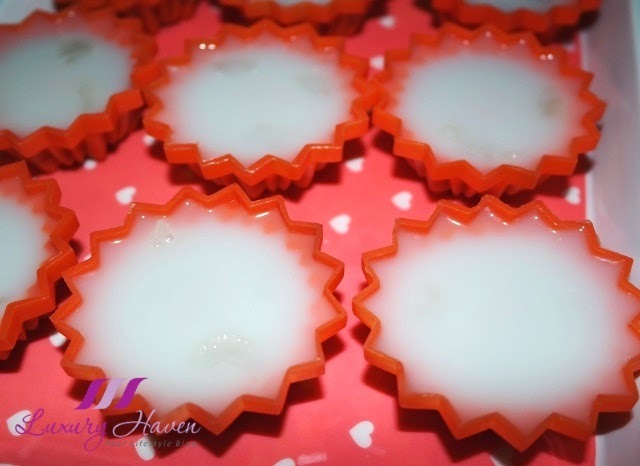 NuStevia Cocoa Syrup Almond Jelly Recipe (杏仁豆腐) + Giveaway! 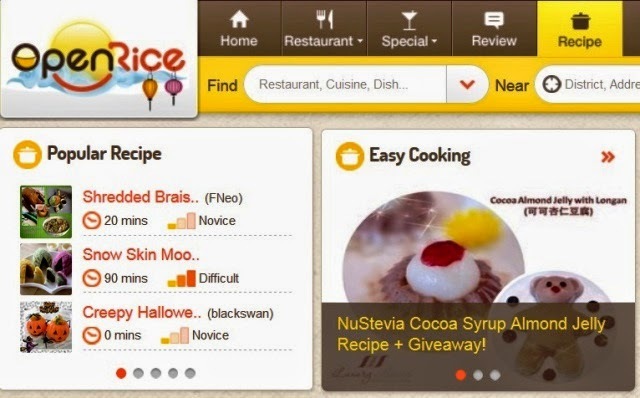 You are here:Home » Recipes » NuStevia Cocoa Syrup Almond Jelly Recipe (杏仁豆腐) + Giveaway! 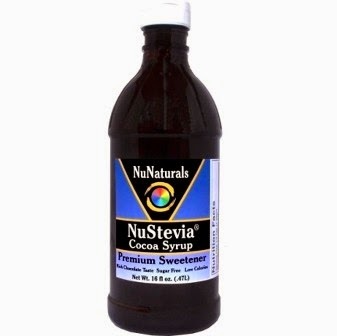 Chocolate lovers, NuNaturals NuStevia Cocoa Syrup is here! 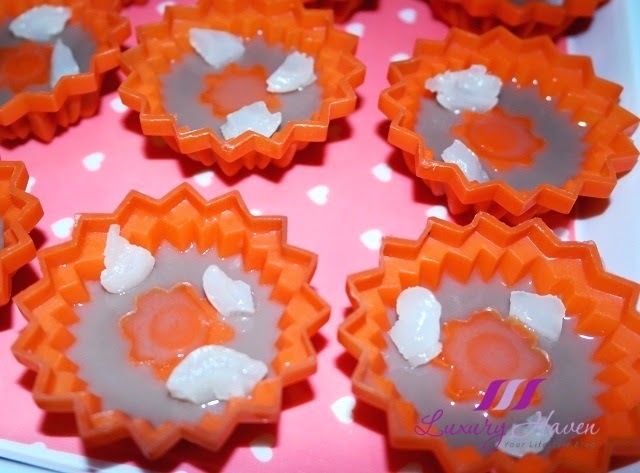 Almond jelly is an extremely popular dessert that can be often found in Chinese restaurants. The sweet treat is usually paired with Longan (龙眼), a fruit closely allied to Lychee. Since my jelly mixture could only fit into 12 moulds, I used the remaining to make a cute Chocolate Teddy Bear Almond Jelly filled with Blueberries and drizzled with Kara coconut cream. Aw, it's too cute! 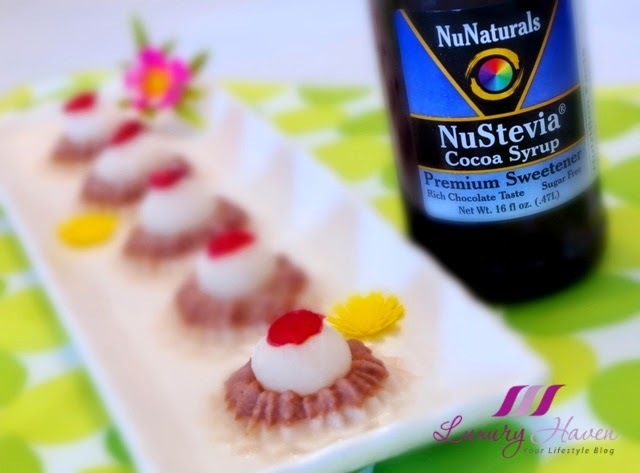 NuNaturals NuStevia Cocoa Syrup is a must-have in your kitchen. 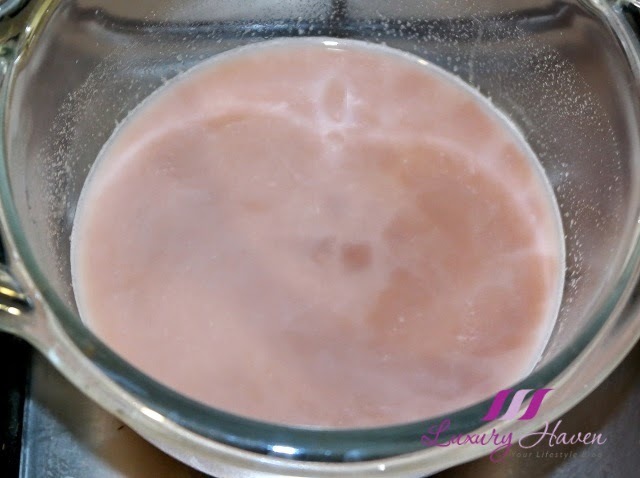 You can use the syrup on ice cream, coffee, and to make healthy chocolate milk. You can have a chocolate satisfaction you crave without the added sugar! ¼ tsp is as sweet as 1 tsp of sugar! Contains no soy, msg, yeast, gluten, wheat, milk, synthetics, artificial colors or flavors, preservatives, sugar, saccharin, aspartame, sucralose, or artificial sweeteners. 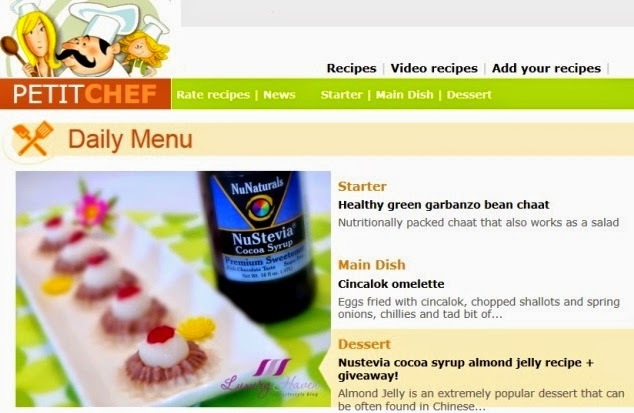 NuStevia syrups are designed to maximize flavour balanced with the right level of sweetness. No refrigeration required. Come, let's get to work with the NuStevia Cocoa Syrup! Add 40g of Holly Farms Almond Premix into 120 ml of boiling water. Stir till powder dissolves, then add 10ml cocoa syrup. Fill about half of the moulds with jelly mixture and refrigerate to almost set. Add another 80g of almond premix into 360 ml of boiling water. Stir till powder dissolves. Meanwhile, cut the Hosen longans into cubes and add onto harden jellies. Top up the moulds with the almond jelly mixture, and refrigerate. 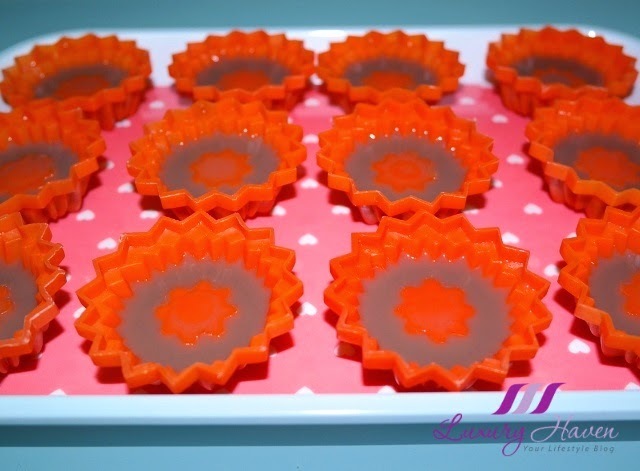 You should have some remaining mixture left depending on the size of your jelly moulds. Add about 5 ml of cocoa syrup into the mixture. Stir well and pour into your preferred mould. I also added some blueberries I found in my fridge. 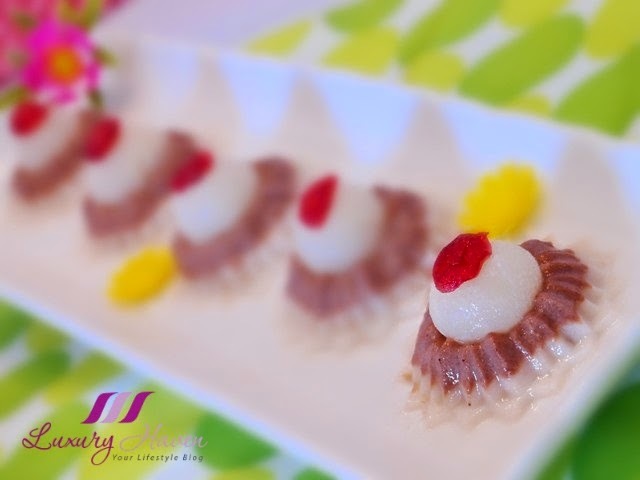 When jellies are set, transfer onto serving plates. 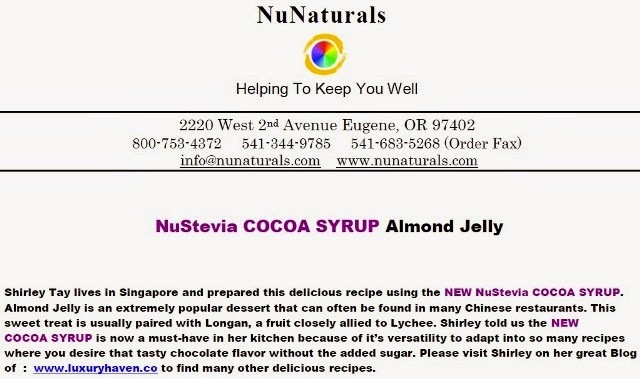 Add more longans and serve your NuStevia Cocoa Syrup Almond Jelly with Longan chilled. 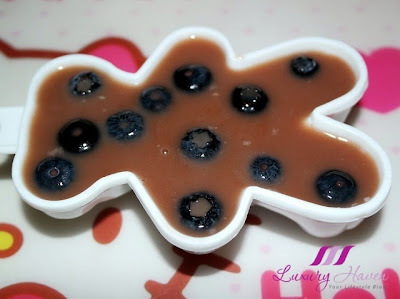 Since the cocoa syrup can be quite sweet, I added some coconut cream to serve with my Teddy Bear Chocolate Almond Jelly with Blueberries and they tasted marvellous! So which do you like? 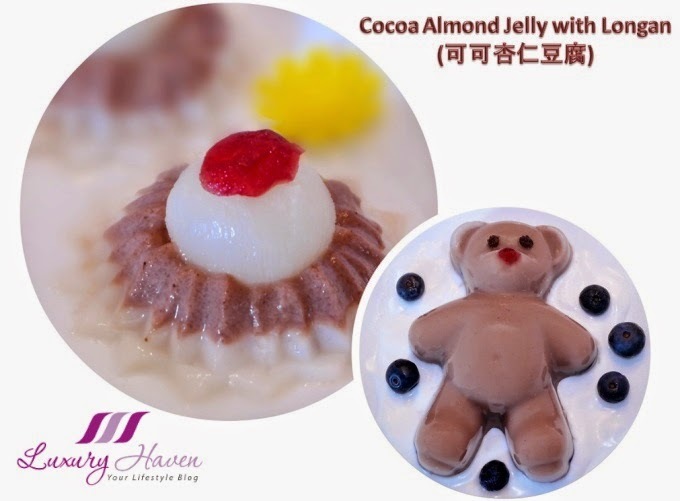 The Almond Jelly with Longan or the Teddy Bear Chocolate Almond Jelly with Blueberries? Now, for the #Giveaway! 4 readers will get to Win an entire set of NuNaturals products for your kitchen! NuNaturals uses premium grade NuStevia extract from which the unpleasant aftertastes have been removed. NuStevia products use only the highest grades of Stevia extract that is selected for purity, sweetness, and superior flavour. What Can You Use NuNaturals Products For? NuNaturals offers sweeteners and baking ingredients that can nutritionally enhance your baked goods, foods, and beverages. 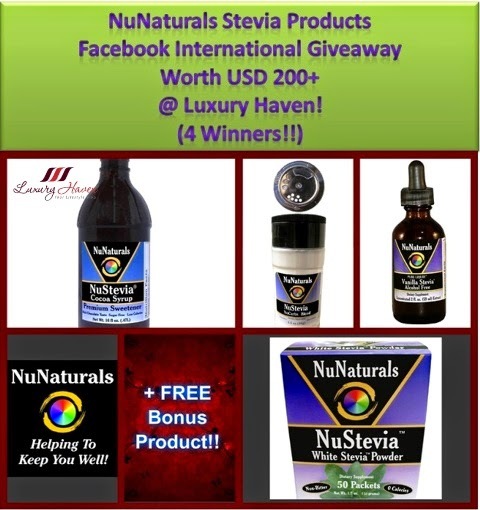 Hop over to NuNaturals NuStevia Goodies Facebook International Giveaway to submit your entries now! * Giveaway is Open to All Worldwide, so don't forget to share and tag your friends in Facebook and let them get into the baking or cooking mood with NuStevia products! Oh so adorable! You surely know how to use NuNaturals NuStevia product for all your delicious recipe. DS, I'm surprised it turned out real tasty! You make everything look easy amd delicious. These are simply divine, nicely made for a delightful treat. Nava, glad you like it too! Great giveaway and that bear looks so cute! Kati, I love it too! Anja, thanks & love having you around! Very cute teddy bear jelly! SD, it's so kiddy! Hahaha! I used Stevia a while back (not NuStevia) but found the taste something I had to get used to. I've read so much about artificial sweeteners though and decided to just reduce my overall sweet intake instead of trying to replace it. It's been great! I don't miss processed sugars (nor artificial sweeteners) at all. Monica, I recalled your previous comments. I've to admit not all can appreciate the taste. Juliana, thanks & you've a good week too! Thanks! I didn't know this dessert. Love the moulds. The Teddy Bear is so cute! Jyoti, glad my bear caught your attention! Oh i like the bear jelly! my cousin sis will be happy to see that! Ciana, hahaha! Hope you'll have fun making them. Maybe we can follow each other on lookbook too? Ann, most happy to check you out! Thanks for coming by! Your kitchen creations always look so tasty and artful at the same time Shirley. Thanks for the intro to this product and giveaway! Rowena, always appreciate your kind notes! All the best to your entry! Kenny, would you like one too?? Heehee! I wish I could find that syrup in Italy!! Coco, you can always join our giveaway & you may be 1 of the lucky 4 to walk away for NuStevia goodies! Christel, thanks for coming by & popping over to your blog now! This looks so yum! Mouth-watering! :) Thanks for sharing. BE, thanks & have a lovely weekend! Wow, they both looks delicious and look adorable. I believe they are turned out yummy too:). 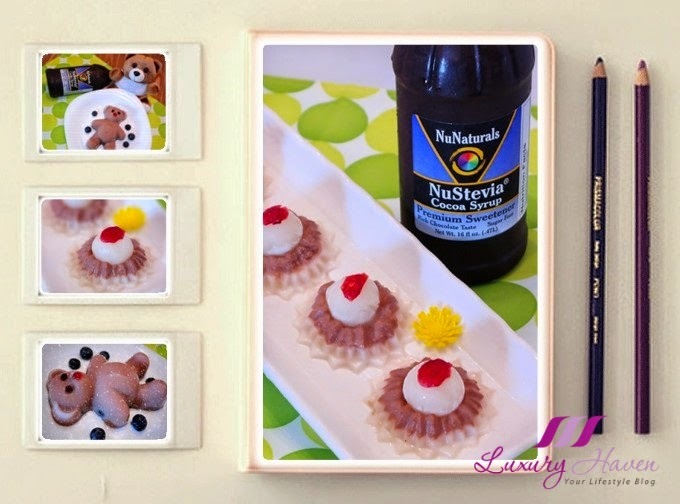 Another Yummy recipe and cute bear!!! EH, I love Mr Bean! That's a brilliant thought - Mr Bean's Pet Bear!! Hahaha!